Imagine if you can search for images, photos and pictures by simply using visual input such as drawing a rough sketch. Retrievr is a search engine that aims to bring that to reality. Based on the user’s sketch on the Retrievr’s basic sketchpad and color palette, Retrievr will search and explore its index which contains selection of Flickr hosted photos through Flickr API by matching most pronounced shapes and slabs of colors, and return the related or loosely matched photos and images to the user. Retrievr is a alternative to text based search that is so dominant in searching technology that make other method of searching seems like an impossible fantasy. 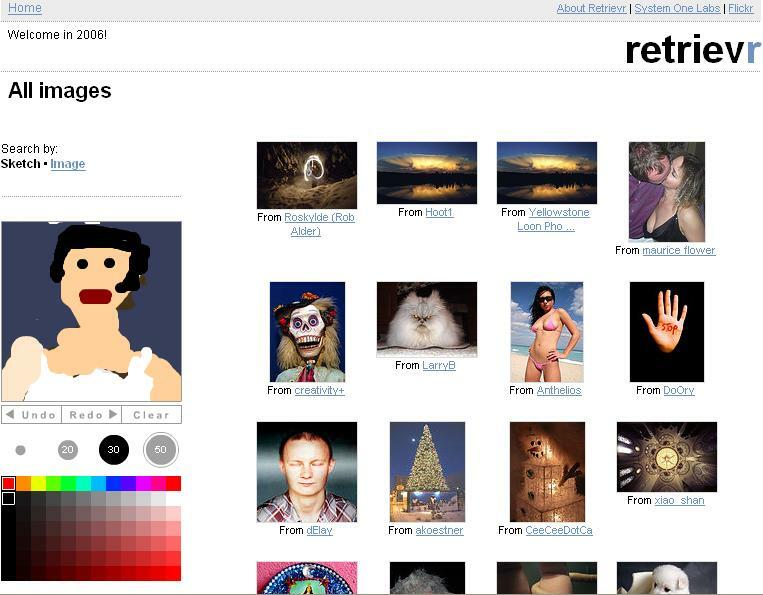 By default, Retrievr’s index only contains selection of Flickr’s most interesting images. However, users are allowed to build their own index by uploading their own photos or or entering the URL of an image. To use Retrievr, user simply draw and sketch their desired image pattern on the sketchpad. Retrievr has a drawing tool that consists of four different brush sizes, along with a selection of 11 colors divided into a wider spectrum of hues. Once user complete every single stroke, Retrievr will automatically search for matching image and display and update the search results in thumbnails in real time. The search will particularly match most pronounced shapes and slabs of colors, however, color has far more accurate matching percentage than shape. Beside, Retrievr doesn’t do any kind of object, face or text recognition too, so it’s impossible to get a image with exactly the same pattern with your drawing. Retrievr sketchpad also allows users to undo the drawings or changes or redo any undo, or simply clear everything and start all over again. If you have no talent in artistic and abstract photos, or simply don’t know what to draw, you can take a look at the Art of Retrievr (no longer available) produced by other searchers to see what images are been returned as search results by these sketches.